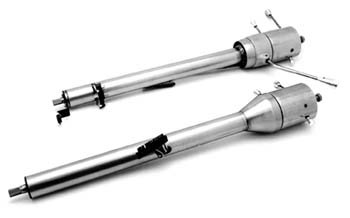 Classic Performance now has direct replacement 5-way adjustable tilt steering columns for your GM car. These columns work with the original wheel and dash shift indicator. Self-canceling turn signals, 4-way flashers, horn wiring and billet knob kit all come standard with each column. Each column either has a 1" DD or 3/4"-36 steering shaft and use an industry standard 3-7/8" GM wiring connector. Columns are available with or without a column shifter and come in a paintable steel finish.